1. Bring a large pot of salted water to boil. 2. Pour 1/2 cup of salsa into the bottom of a 9×13 baking dish and set aside. 3. Cut the zucchini in half lengthwise then with a small spoon or melon baller (I used my tablespoon measuring spoon), hollow out the zucchini pieces but leave ¼″ rim. Save ¾ cup of the zucchini flesh and chop into small pieces. 4. Drop the zucchini halves into the boiling water and cook for one minute. Remove from water and set aside. 5. Preheat the oven to 400 degrees. 6. In a large skillet, brown the ground turkey, breaking it up while it cooks. When it’s no longer pink, add in the spices and mix well. 7. Add in the chopped onion, reserved zucchini, tomato sauce, and water. Stir it up then cover and simmer on low for 20 minutes. 8. Meanwhile, arrange the boiled zucchini halves into the bottom of the 9×13 dish. 9. 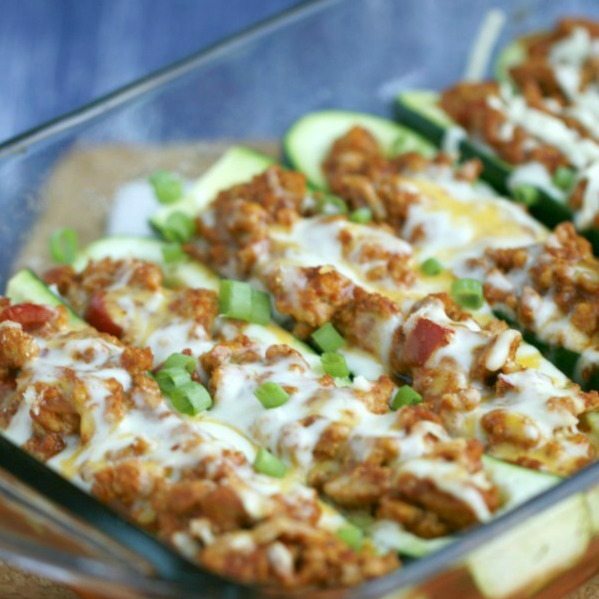 Once the meat mixture is done, spoon the mixture into the zucchini boats evenly. Press down so the filling stays in the boats. 10. Top each half with a sprinkle of cheese. 11. Cover the pan with foil and bake for approximately 30 minutes until the zucchini is fully cooked and the cheese is melted. 12. Serve with sour cream and more salsa.